Essential plot rundown: A fish must find his son, who has been captured by the evil white man. They converted this to 3D and released it in theaters. And as I'm a fan of 3D, I decided to go check out the results. I really liked Finding Nemo. It is an all around well made film. The story is compelling. It is a pretty basic story that anyone can relate too. The characters are interesting and like-able. It even has some touching moments between the characters. Not much to say really about the film itself, other than it's good. What I really wanted to address was the 3D. It was amazing! I like 3D; I feel it can add a lot to the movie. However, I'm a little uncertain of my feelings towards converting movies to 3D and releasing them in theaters (i.e. Star Wars Episode 1, Titanic, The Lion King). It's like taking a black and white film and making it color. 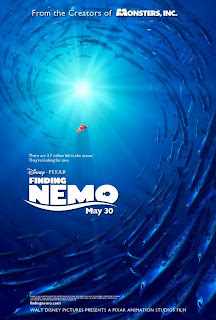 However, when I heard they were doing it with Nemo, I was exciting because this is the perfect movie to be in 3D. The ocean is vastly immense, with layers and layer. There is so much more depth in an ocean than in a building or where ever. And the 3D really accentuates that. It was like I was really swimming in the ocean. You can really feel the distances between the fish and the size of the ocean; it feels like it goes on forever. And not only was it cool for the ocean scenes, but it even worked on a smaller scale. When Marlin and Dory were swallowed by the whale, the whale's baleen looked awesome in 3D. 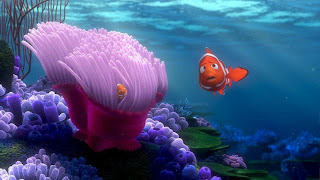 So, long story short, not all movies need to be in 3D, but Finding Nemo truly benefits from it. So, overall, Finding Nemo is a really good movie. The story is strong, the characters are like-able, and it touches on some themes and has moving moments. And, if possible, see it in 3D.